The new onboarding flow focuses on gathering signals as much as possible and then making a single recommended “starter pack” of great accounts. Instead of suggesting generic popular accounts, we wanted to listen to people and use that feedback to provide the type of content that is valuable to them as an individual. In the old sign up flow, we saw people often skipped creating a profile. We learned from research that we need to first communicate and demonstrate the value of our product before asking for investment. We believed that once people start engaging with the content they enjoy, they’ll be more willing to add a bio or upload a profile photo. We created a contextual walkthrough for new users to complete their profile that would meet them in the way whenever they were ready to make that investment. New Users: "I don't know what to follow"
Every day thousands of people sign up for Twitter. As for anything new, it is imperative to give people an easy understanding of Twitter and quick steps to set them up for success. For people who are brand new to Twitter, finding which accounts to follow can be a lot of work. People who didn’t have enough guidance or strong curiosity ended up with timeline feeds that were either too sparse, too overwhelming, or full of content they don’t care about. As a result, their first impression of Twitter was not so great. They missed all this great stuff here: friends you want to follow, communities you want to connect, conversations you could have. Many new users sign up for Twitter without any idea of who to follow or why. Searching friends one by one or sorting through profiles is tedious. It’s our responsibility to serve up the most relevant content and immediately show them the power of a well-curated timeline. 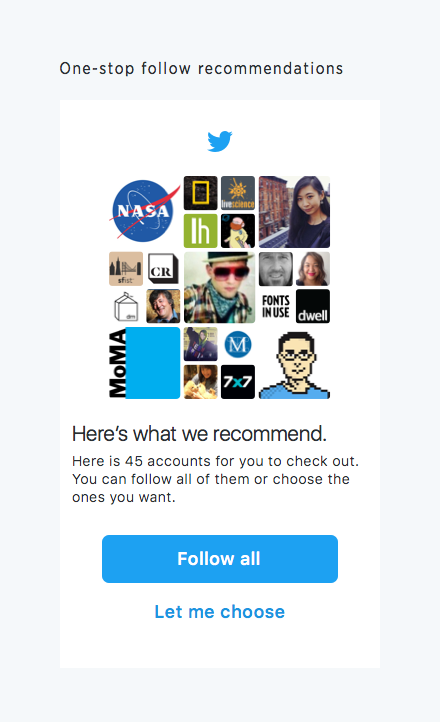 Based on multiple sources of input such as interests, current friends on the platform, and location, Twitter recommends the best possible initial accounts to follow, all in one place. The user can then tap “Follow all” and instantly be rewarded with a valuable timeline. More follows doesn’t necessarily lead to more user engagement or retention. 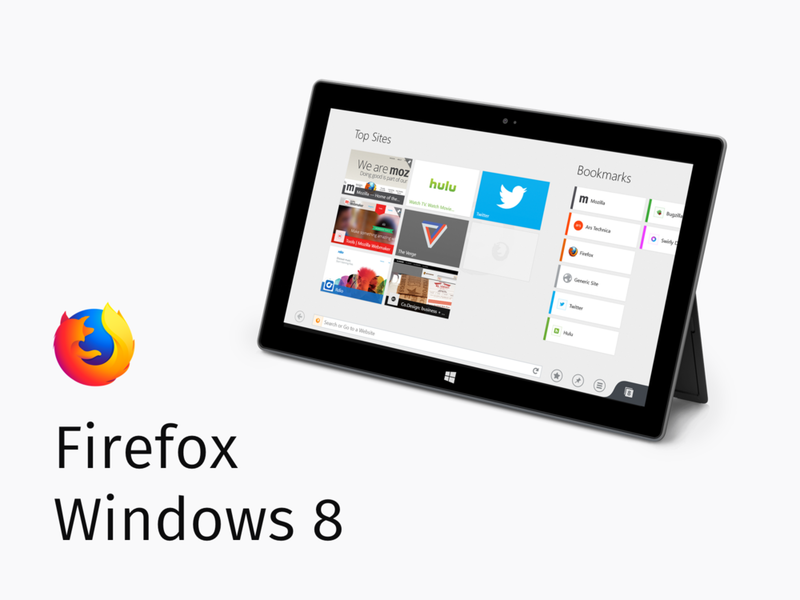 We’ve built in a quality score into the recommendation engine to provide high quality and tailored results. 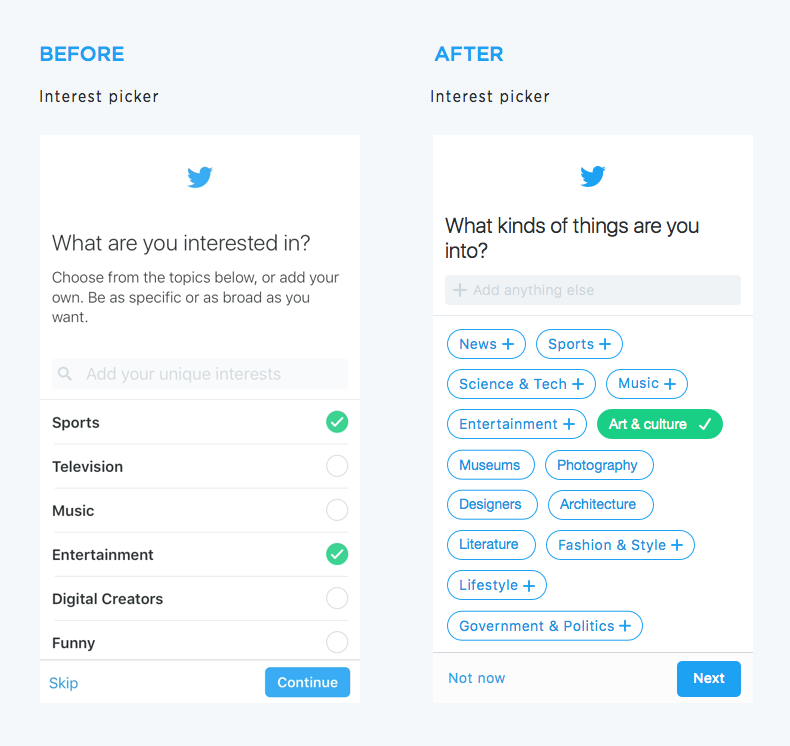 We launched a new interest picker that allows searching and adding custom interests. The new topic taxonomy combines human and algorithmic curation, supports multiple levels of topics, and scales globally for every country. We worked closely with content strategists to make sure the messages were clear and understandable to new users at all times. It’s important to guide people along in an open and informal tone, and avoid introducing Twitter jargon before explaining it. For example, we transformed the loading screen into a lightweight education animation about how Follow works on Twitter. The messages circle through and provides just enough context for what they’re about to do next. After we launched the cross-platform full redesign of Twitter onboarding experience, the results showed new follows and mutual follows both increased nearly 50%, along with an increase in time spent on Twitter as more people graduated into more active states. The work was featured in Twitter Q3 2016 earnings call & shareholder letter. Partners: Paul Lambert(Product), Rafae Aziz(Research), Stephen Fox(Content), Margo Stern(Content), and Twitter Onboarding Eng Team.